My new painting is almost finished. 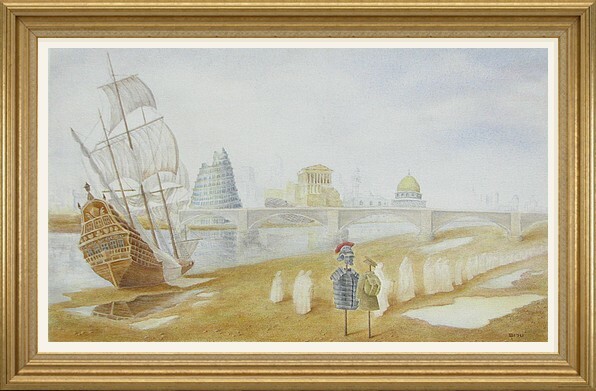 It is titled "Unreal City" and is part of a series on visual readings of famous poems. This painting is based on The Wasteland by T S Eliot. The painting takes it title from a line that is repeated many times in the poem. The images are drawn mainly from the following lines. I had not thought death had undone so many. And each man fixed his eyes before his feet. With a dead sound on the final stroke of nine. There I saw one I knew, and stopped him, crying "Stetson! "You who were with me in the ships at Mylae! "Has it begun to sprout? Will it bloom this year? "Or has the sudden frost disturbed its bed? "Or with his nails he'll dig it up again! "You! hypocrite lecteur! - mon semblable, - mon frere!" The painting is an interpretation of the poem. As I understand the poem speaks about the futility of human conflicts irrespective of the time or place in which they take place. 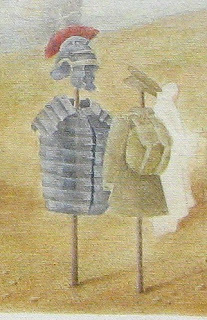 Hence my foreground figures that represent a Roman soldier and a World War I soldier symbolising Stetson and the protagonist who defy time and meet in the background of the London Bridge. The message we get is that all war is one war, equally absurd. The place is any place. Jerusalem, Athens, Alexandria, Vienna or London, the place is irrelavant. I use some landmarks of Jerusalem, Athens, Alexandria and London to represent them and show that the scene depicted is 'any city'. Also I represent the 'falling towers'as the Tower of Babel which is relevant as the poem depicts failures in communication. 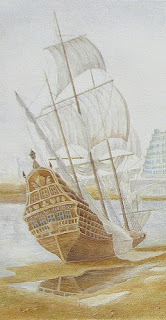 The half completed tower in the picture represents this.The ship stuck in the drying river evokes connotations of the Smyrna merchant. 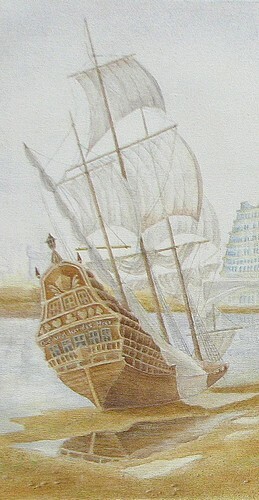 The ship is inscribed with the lines 'Od' und leer das Meer'. Your views and comments are valuable to me. Be generous with them. Biju P Mathew. Ethereal theme. Powered by Blogger.